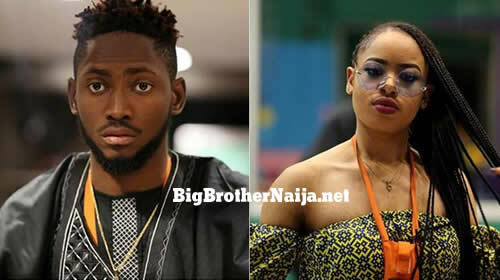 Big Brother Naija 2018 finalists are lovers, Miracle and Nina spent the entire night quarreling as they couldn’t agreement on a number of things. As the other housemates were turning down for the night and getting ready for bed, Nina and Miracle were engrossed in a fight that had them both declaring “I’m not happy”. The real cause of the midnight rumble, which both termed a discussion and not an argument, is Nina’s attitude towards Tobi and Alex, as well as her being, according to Miracle, a person he doesn’t recognise. Nina also made it a point to reference how Alex and Tobi had told him she is using him to play the game and that their romance is not genuine, as a catalyst. “Since Tobi told you this, you have this mind-set that I am not real. Don’t let him fill your head with things that are not true. When we leave this House, you will find out who your real friends are,” she said, ominously. Day 29: Three Pairs Are Up For Possible Eviction This Week, Who Are You Saving?